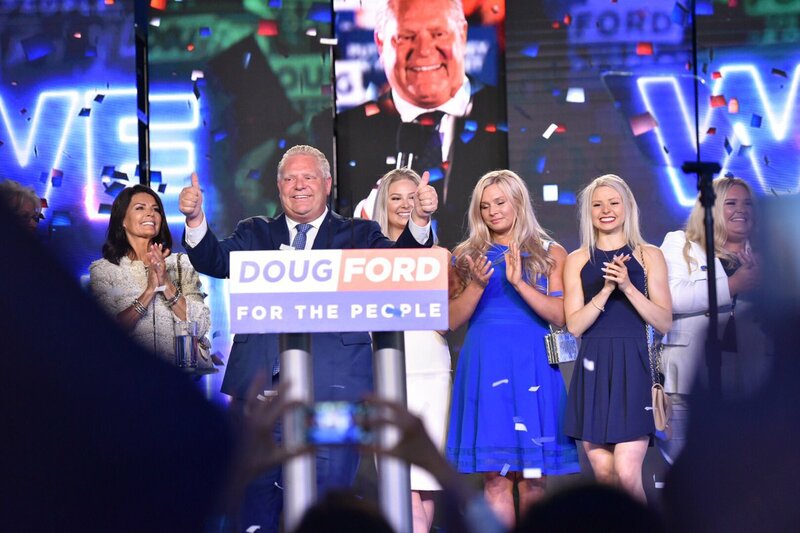 With Doug Ford’s win for premiership of Ontario, Canada gets a Trump-like politician in a major position of leadership. Just as Justin Trudeau’s election as Prime Minister echoes Barack Obama’s – Trudeau was young, charismatic, and inexperienced – Ford’s election follows a path similar to Trump’s. Trump’s path to victory was – while overall right of centre – along certain broadly populist positions, often to the left of his major opponent, and delivered with charisma. Ford focused on the economy and energy, two major focuses of Trump in the last Presidential election. Ford has a genuinely successful business background – like Trump – and even uses thumb’s up a lot, just as Trump does. Many people speculated that Kevin O’Leary, who ran for leadership of the Conservative party in Canada (and eventually withdrew before the nomination voting), was Canada’s answer to Trump, but O’Leary wasn’t really an analog. He lacked the charisma, the genuinely successful business background (the only company O’Leary built crashed and burned soon after he sold it), and most importantly, the populist flair. Time will tell whether Ford’s ascent to Premiership of Canada’s largest province paves the way for a federal run, but at least for the people of Ontario, they now have the Canadian equivalent of Trump. A nicer, saying ‘eh’ more often (and lacking the immigration issue, which is a federal responsibility) version of Trump. To see the Ontario 2018 game and learn more about who was just elected, see here. I didn’t know that: A) Kevin O’Leary was Canadian, B) once came close to being the leader of the opposition in a major nation. And I say this as I only know him from the tv show Shark Tank. Was this the same guy who was caught doing cocaine in the capitol? I think you’re referring to Rob Ford – no, he passed away two years ago, at the age of 46. Doug Ford is his brother.